A group of Saradominist monks have been slaughtered, survived by a lone and frightened monk. Something is afoot though as the souls of the slain are not able to pass into the Underworld! 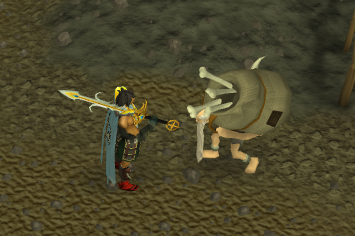 Can you figure out what has happened before complete chaos envelopes Gielinor? 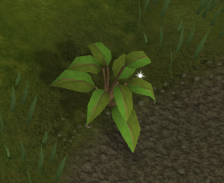 Speak to Brother Samwell who can be found by the road to the Paterdomus, east of Varrock and just north of the Digsite. Items: Free inventory space for quest items. To begin the quest, speak to Brother Samwell who is found on the road to the temple, east of Varrock and just north of the Digsite. He is hysterical, proclaiming that someone killed his brothers yet kept him alive and that the souls of his fallen brethren are unable to pass onto the next life. Calm him down before offering to help search for evidence so the killer can be found and brought to justice. Samwell hands you a notebook, of which you will use to write down clues you find. The clues are scattered in the nearby area and can be uncovered by investigating the various objects. Head to the slaughtered monk north-east of Samwell and investigate his torso where you will find that he has been impaled with small crystals. Just south of that monk you should see a bush that has a flashing sparkle, investigate it and you should find a ring. 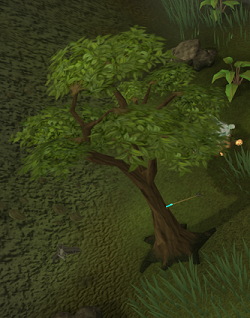 Head south-west and you should see a tree with an arrow stuck in it; investigate it. Investigate the slaughtered monk nearby the tree and listen to what he has to say, telling you that a masked face trapped him. Once you have found all the clues, talk with Samwell. Tell him not to worry and that you will get through this, and that he should try to focus. He will look over the clues and comment that the Elves are well known to possess such crystals and will recount a tale of Seren before concluding that it doesn't make sense. You agree that it all points to the Elves. Ask him if there are any other possible witnesses and he will tell you that he noticed a strange man carrying a sack of bones muttering to himself - just west of the area. Head north-west and up the stone steps where you will find the Odd Old Man. Talk to the Odd Old Man and ask him about the slaughtered monks. He will refuse to say anything, although you notice a slight sympathetic look cross his face. Use the option of Persuasion and he will tell you that he may have seen Elves within the area. You notice a glimmer of curiosity across his face and so use Persuasion to keep him talking. He will say that he does in fact recall seeing an elf on the path today, heading eastward. If you inquire further, he says he didn't hear anything so this time use the option of Threatening him. He recounts that he heard lots of screaming and shouting though as he peered over the rocks it was already over. He did however glimpse a tall, hooded figure making off into the distance east. He seemed to be much taller and was wearing dark clothes, which contradicts the claim of an elf. Go back to Samwell with your newly discovered information and go over it with him. He claims that he is still in shock and unfit to draw a conclusion and so asks for your thoughts. Go through any option put forth and he will still be apprehensive. He will tell you to look for further clues and try to find another witness. Travel east along the path until you find crystals on the ground. Follow the trail and you will find yourself at the body of a dead Elven ranger, whose soul cannot pass through to the Underworld either! Investigate her arms and you will notice a freshly branded Saradomin symbol and listen to what she has to say. Investigate the nearby plant and you will find a necklace. Head east and investigate the fence, noting the rough linen cloth was part of a blue robe. North of the fence you should see a bench. Investigate it and you will find a letter. Read it. Go west, up the mountain to the beacon, and you will find Blaze Sharpeye. Ask him about the murdered elf to which he will look away with disinterest. Threaten him and he will start talking about his glorious fire. Threaten him again and he will finally start giving you information; stating that he heard a scream from downhill and tried to get a look at the killer. Persuade him to continue and he will tell you that the killer suddenly vanished, in a fashion that differred to the usual teleport. Everything went dark, as if a rift was opened that sucked all the light from the area. Head back to Samwell with all of the clues and present them to him. He will note that the killing has something to do with Seren and Saradomin, however there is currently no feud between the two. Tell him that you'll get to the bottom of this. He will ask if you encountered any more witnesses to which you will reply that you spoke to the beacon tender, who explained his method of teleportation. Samwell will be confused, stating that he has never heard of anything like that before; it's definitely not a normal teleportation spell. 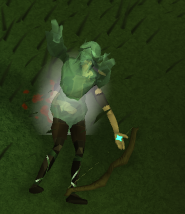 He will instruct you to go talk to his old friend Valina, a wizard specializing in crystal magic, found at the entrance of the Wizards' Tower south of Draynor. 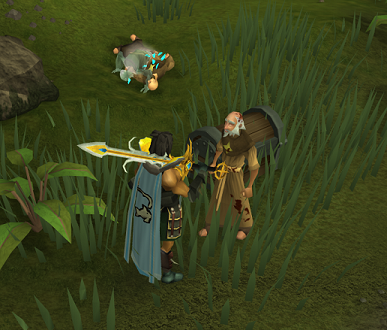 Head to the Wizards' Guild south of Draynor where you will find Valina at the entrance. Tell her that Samwell directed you to her and that he needs her help. You show her your notes and she looks through them. Ask her about the Crystals and she will explain that crystals are extremely precious to elves, and to just discard them so carelessly is highly irregular. The crystal arrow is also quite peculiar, one that she has yet to come across. She will comment that the clues are quite misleading. Ask her about the Wizards. As she oversee's who comes and who goes throughout the tower, she tells you that no Saradominist wizard has left the tower for a significant amount of time, but she cannot account for all wizards across Gielinor. She does say that this is highly uncharacteristic for a Saradomin follower. Tell her that it sounds like she's trying to hide something, to which she will further explain why a wizard didn't do this, highlighting the fact that the elf was killed by an accurate stab wound (wizards are trained in magic, not melee) and traditional wizard robes have a distinctive shine (as opposed to the rough linen cloth found at the murder site). She concludes that the killer was trying to impersonate a wizard. Ask her about the Teleportation. She says that it doesn't sound like a regular teleport spell, and it is possible that the killer opened a rift to escape to a darker realm of dimension, although this requires powerful magic which most wizards have yet to master. You have learned all the information you need, so go back to Samwell and present your findings. Poor Samwell is just far too confused to be able to provide any valuable insight. Tell him what you think is going on (option choice is irrelevant) and he will say that someone might be trying to turn Saradomin and Seren against each other, to give them cause for a fight. You agree, however note that there's still the pressing matter of the tormented souls. At that point, a Strange Voice speaks up, offering an explanation to the conundrum. Choose an option, and Icthlarin, God of the dead, will suddenly erupt from the ground! He explains that Death himself has gone missing, resulting in the souls of the dead remaining in a state of limbo. He doesn't know what has happened to Death, but must find him quickly before Gielinor is thrown into a state of utter disarray. You show him the clues you have found and he affirms that it is the Mahjarrat Sliske who is behind the attack. Several level 10 Wights spawn, causing you and Icthlarin to team up in defeating them. With Icthlarin's help you should dispatch of these easily. The final Wight will drop a Mysterious Box, which you will automatically retrieve. Icthlarin will note that something was protecting them, as they were able to withstand the brunt of his attacks. The Mask on the Box unexpectedly pipes up, offering Icthlarin an invitation to a most exclusive event at the Empyrean Citadel - the grand ascension of Sliske into godhood. Icthlarin initially declines the invitation, however the Mask proclaims they have captured Death, before finally shutting up. 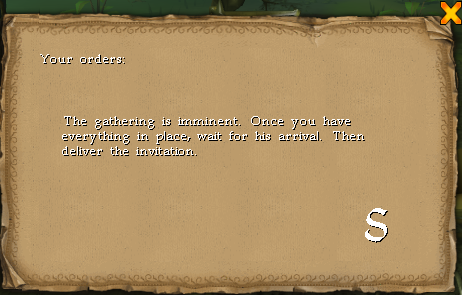 Icthlarin has no choice to attend and also adds that the crime scene laid forth by Sliske will too force Seren and Saradomin to be there. Icthlarin would like you to attend the ascension ascension as well. You are now given a break, and you should use this opportunity to stock up on a few pieces of food just in case; although the following battles aren't difficult, even to a low-level player. Once you are ready, open the Mysterious Box and you and Icthlarin will be teleported to the Citadel. Walk up the ramp and you will find many high-ranking god followers assembled in the area, accompanied by the Barrows Brothers who are blocking the doorway to the grand ascension. You may take this time to talk with the various followers, whom offer some interesting dialogue although are not important to the storyline. Talk to Icthlarin when you wish to continue. Icthlarin suggests to split up in search of Death, and the door to the west of you will unlock as Icthlarin enters the grand ascension. Enter the western room and move north to the viewing angle where a cutscene ensues, showing the various gods present arguing with each other and complaining that Icthlarin is too much of a noob to be allowed an invitation. After that has finished, head to the south-east corner and go through a window, where you will be presented with several methods of navigating the outer wall. Jump the gap, run across the planks, drop down the rocks, climb the rock face, climb through the obstacle and enter the northern door. 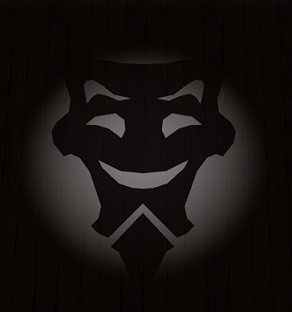 Sliske's Mask will start talking you, offering you a hint for the next room. 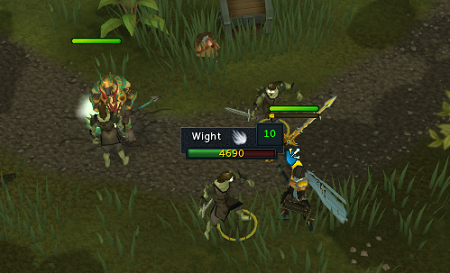 In the next room you will encounter several waves of level 10 Wight's. Pull the various levers found around the room to turn on the spotlights. 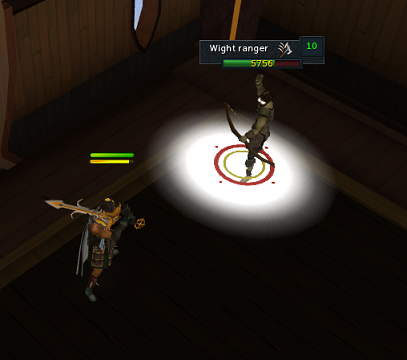 When attacking the Wights, they must be standing in the light or else you will not deal any damage. Once you've killed them all, the door will unlock. Go to the viewing window in the eastern part of the room and another cutscene will take place, where you see the gods getting increasingly angry with each other. After that, go through the door and into the next room. Use the viewing panel found in the middle of the room and you will encounter two faces, telling you that you're in the light chamber, wait no shadow chamber, no...it's the light chamber. Once you have completed that, the door will unlock. 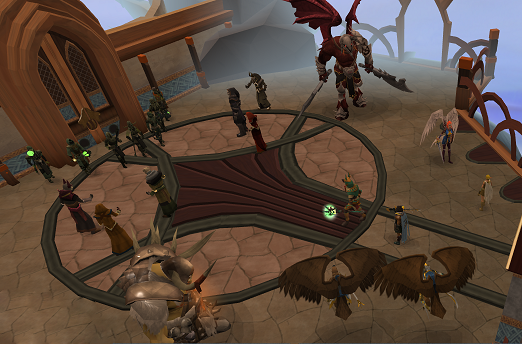 Head south to the viewing window and you will see Sliske spawn! Go through the door and into the final challenge room where you finally find Death! Or, rather, a statue of him. 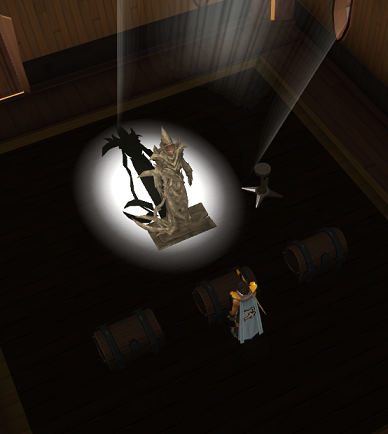 Speak to the Statue and the Mask of Sliske will tell you that you must answer three riddles before Death is released. I can build castles, that melt in the rain. But I trickle down, as the seconds drain. What am I? - Sand, found in the first chest. I can fall from the sky, but I cannot climb higher. I spring with no legs, I run but don't tire. What am I? - Water, found in the second chest. Glass can't create me, but stone and steel do. I'm made by the sun, but out of its view. I can be tiny, and also be vast. In the shape of my maker, like a spell I am cast. What am I? - Shadow, found in the second chest. Alas, the Deathly reunion was not meant to be. 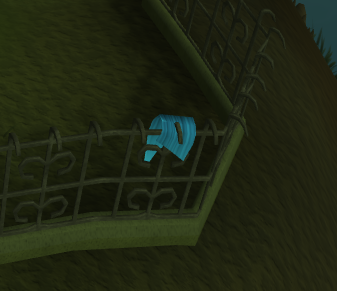 Instead, the Mask gives you an Invitation to Sliske's ascension. Look through the viewing window east where you find the gods yet again arguing. Sliske interrupts, but the gods begin threatening to kill him and so Sliske unveils both Death and Strisath the Dragonkin either side of him in cages. Sliske offers to kill Death and release the Dragonkin should the gods attempt any harm to him, which causes them to fall silent. 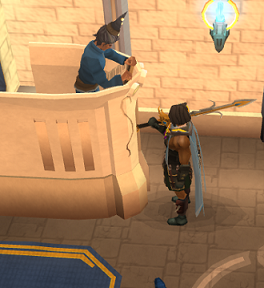 Go through the door, climb down and talk to one of the Barrows Brothers, who will let you in to Sliske's ascension. This causes the gods to yet again start arguing over your right to attend such an event. 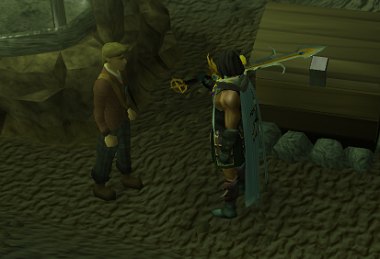 Sliske then says that he has happened over two Elder Artefacts; the Staff of Armadyl and the Stone of Jas. 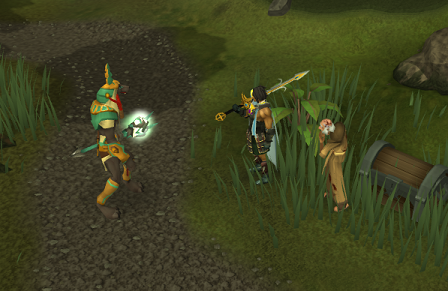 The gods are dumbfounded, and show apprehension towards Sliske's use of such powerful, and dangerous, tools. The gods start asking Sliske if he has ascended to godhood yet, or will do so anytime soon before Sliske announces the real reason why he gathered them all here; a contest, a free-for-all, a battle of the gods. He says that it is only a matter of time before the moon - Zanaris - fully eclipses the sun casting Gielinor into total shadow, at which point the contest will have ended and the winner decided by whomever has killed the most gods. The gods ask why they would even participate in such an event, at which point Sliske answers by stating the prize for the contest; the Stone of Jas. 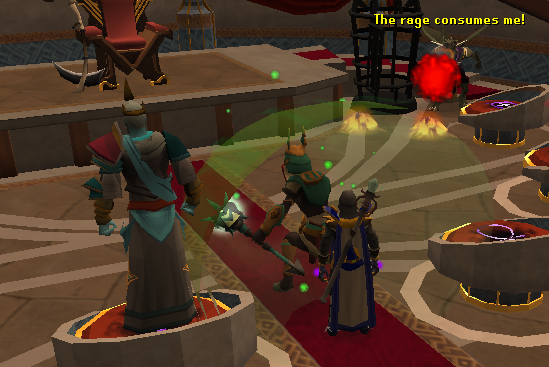 After some more arguing, Sliske throws you the key to Deaths cage, then attacking Icthlarin and setting the Dragonkin free (who subsequently goes on a rampage) before teleporting away. Icthlarin throws up a shield to block the Dragonkins attacks and tells you to go free Death from his cage. Run west then north, stamping out any flames you encounter. Once you reach Death's cage, release him and run back to Icthlarin. Make sure you avoid the Dragonkin's attacks and free Death before Icthlarin's shield reaches 0% or you will have to go through the sequence again. As you reach Icthlarin, a cutscene will occur where Death teleports you, Icthlarin and himself to safety, back to Samwell's position. Go through some additional dialogue between the four of you, with Samwell asking if Sliske was bought to justice and Death reassuring him that his brothers will move on to the next life, and Icthlarin thanking you for your help. 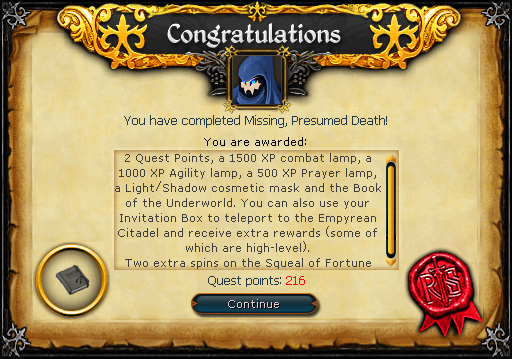 Congratulations, quest complete!